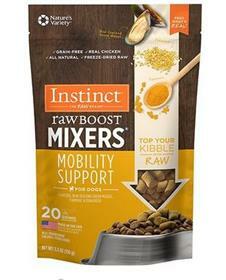 With Instinct by Nature's Variety Freeze Dried Raw Boost Mixers Grain-Free Mobility Support Recipe Dog Food Topper, you can top your dog’s kibble with raw nutrition! This delicious food topper provides natural glucosamine and chondroitin to help support healthy hips and joints. Combining cage-free chicken with vibrant, functional, whole-food ingredients like pumpkin and sweet potatoes, it’s 100% freeze-dried so it’s bursting with flavor and nutrition. Plus, it’s made in the USA with zero grains, corn, wheat, soy, potato or anything artificial. Ingredients: Chicken (including Ground Chicken Bone, source of Glucosamine and Chondroitin Sulfate), Chicken Liver, Pumpkinseeds, Ground Flaxseed, Salmon Oil, New Zealand Green Mussel, Turmeric, Fenugreek, Mixed Tocopherols (for freshness), Rosemary Extract.